I will admit that tempeh scared me. 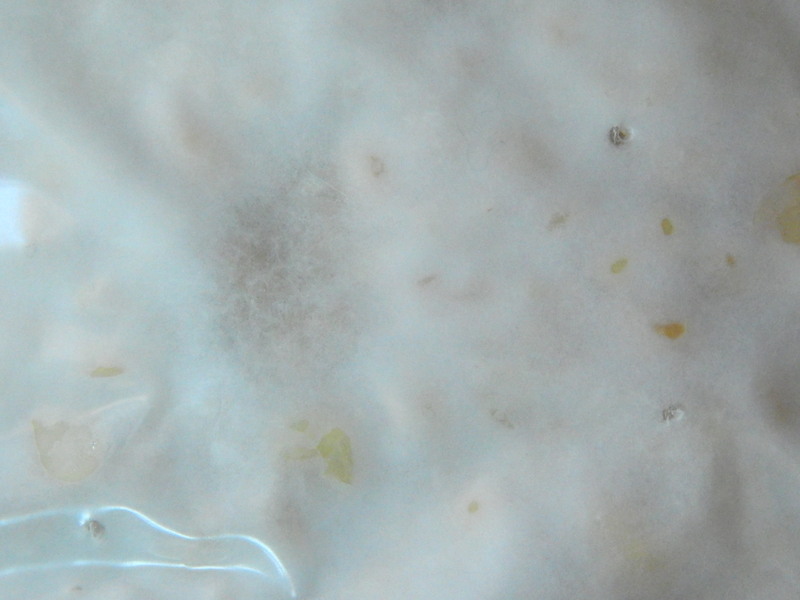 The idea of letting soybeans grow mold was one step further than my usual level of fermentation. Like natto, cheese and cured meats, it was a ferment that I had been blissfully ignoring… until someone arrived on my doorstep with a package of tempeh culture and a piece of advice about how to save the spores. So I took courage… and read everything I could on making tempeh… then I made my first attempt. The results were surprisingly – amazingly – incredibly delicious. The flavour was completely different from store bought tempeh. It was both nutty and creamy at the same time, more like eating edamame than the dense tempeh that I had bought in the supermarket. I had become a master of the mold. 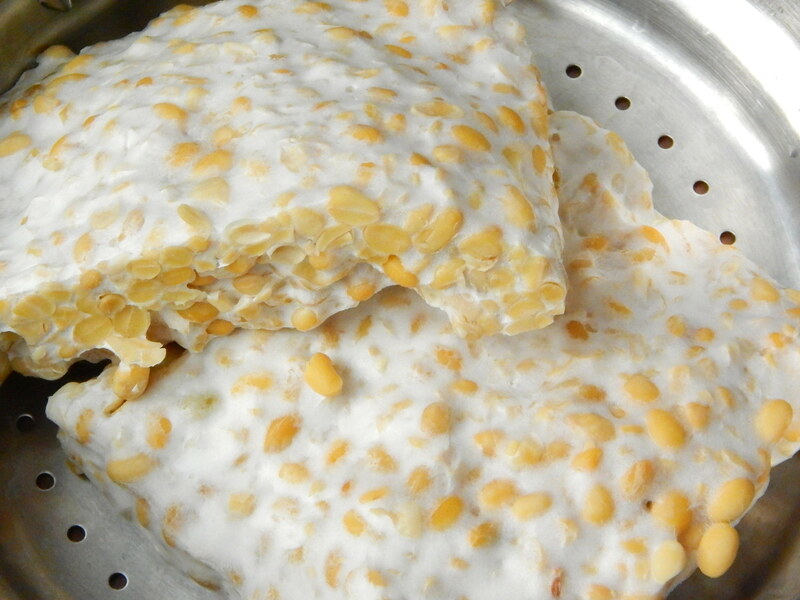 Tempeh is an Indonesian dish where a mold culture is used to ferment soybeans until it forms a cake. 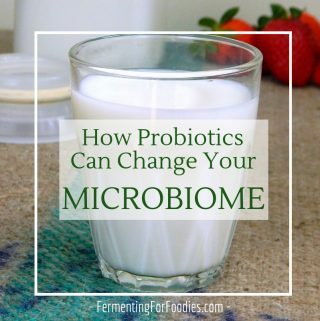 The fermentation process is not only delicious, it also turns the soy beans into a complete protein that is more easily digested. Tempeh is also more likely to be tolerated by those who have trouble with soy (tofu, edamame and other unfermented soy products). 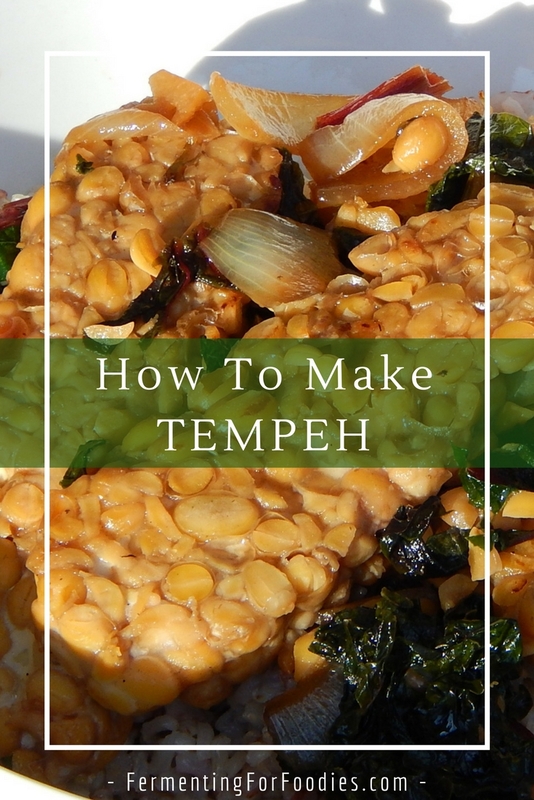 Tempeh has a nutty flavour that is delicious all on it’s own. However, it can be smoked, marinated or sauced which allows for all sorts of interesting flavour options. If you are uncertain about how to cook tempeh, try it thinly sliced it for a Reuben sandwich, barbecue it, or dice it up for a stir fry. Cleanliness: I will admit that making tempeh is not easy. There are a number of steps involved and you need to keep things clean as you go along. You don’t want to accidentally grow the wrong type of fungus.
. Don’t forget to make your own starter to save for future batches. with needle holes poked through at 1 cm intervals. kept warm with jars of water heated to the right temperature. The only trick is to measure the temperature as you go along, because tempeh starts to self-generate heat as it ferments. The right temperature is important because if it’s too cold your mold won’t grow, and if it’s too hot you will kill the spores. The hulls of the soybeans need to be removed in order for the spores to inoculate the beans. , then you can pass soybeans through on the coarsest setting. You want the beans to just split in half, so if it’s coming out too fine then this won’t work with your grinder. Once the beans are split put them into water so that the hulls can float . Massage the beans to loosen up all the hulls, then drain off the floating hulls. You may need to do massage the beans for hulls several times to make sure that you’ve gotten rid of all the hulls. Soaking method: Soak the beans for at lest 12 hours. Then with your hands or a potato masher massage the beans so that the hulls fall off and the beans split in half. The hulls will float to the top, so drain off the floating hulls as you go. This is quite time consuming, so if you find yourself making tempeh a lot, then I’d suggest that you buy a grain mill. 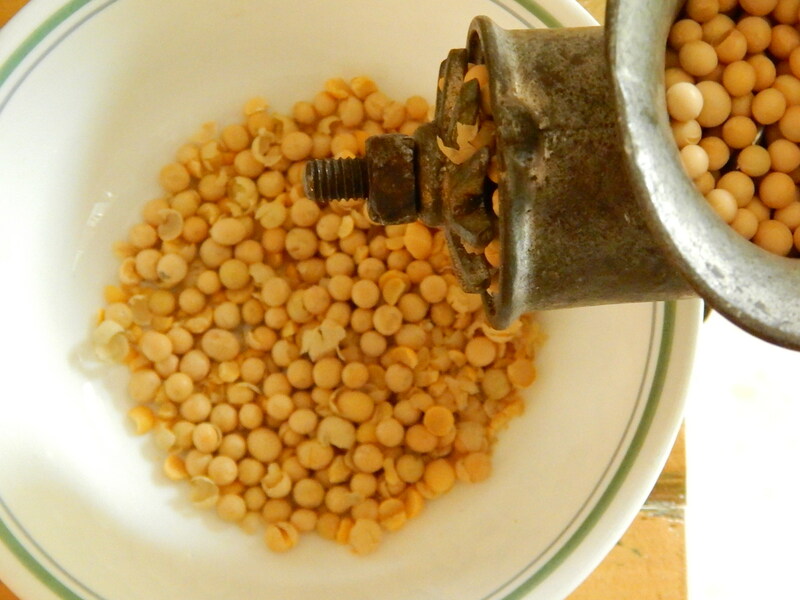 Cover the soybeans with water and soak for 12 -18 hours, even if you use the dry method for dehulling (see above). Bring the soybeans to a boil and simmer, until the beans are soft but not mushy, (about 1 hour). Drain the beans and gently pat them dry with a towel, then allow them to cool to just below body temperature. Mix the vinegar with the beans (to lower the pH so that unwanted bacteria won't grow). Sprinkle on the tempeh starter and mix well so that the beans are evenly covered by the spores. Incubate at approximately 88 F (31 C). Check the beans after 12 hours. At this point the mold will have started to grow and the beans will start generating their own heat. You may need to lower the temperature. 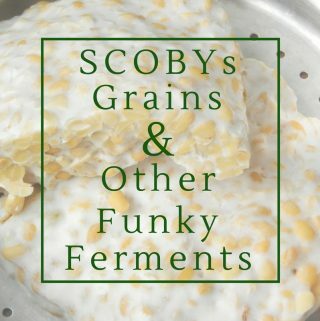 At this point stop the fermentation by transferring to an airtight container and refrigerating for up to 1 week (see below for cooking and freezing instructions). -Black and gray spots may appear on the tempeh. These are the mold spores, and they are completely edible. The tempeh should smell nutty, mushroomy and it might have a hint of ammonia. If it smells bad, is mushy or slimy then throw it out. – In general, it is tastier if you stop fermentation before the tempeh starts to spore. However, if you want to save mold spores for future batches, you can find instructions here. -Tempeh can be eaten raw, though it is generally steamed before eating. Steamed tempeh can also be frozen for up to three months. , or with a colander over a pot of boiling water. 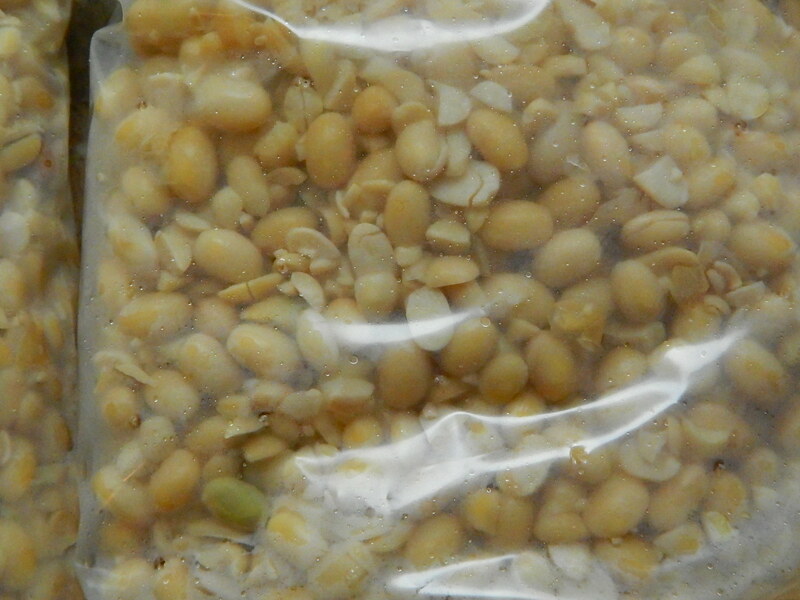 Soybeans in the bag with the mold spores before incubation. Here is the tempeh after 30 hours (still in the bag). You can really see the mold fibers! And this is what the tempeh looks like after it’s been steamed. I accidentally added two teaspoons of tempeh culture instead of one! How will this effect my tempeh? It will probably be fine… if anything it might culture a bit faster? More culture is usually fine as long as there’s food to feed it. explains more product tempeh starter, please?